Expedia has some top notch Sydney holiday packages. Bundling your bookings is a surefire way to save time and cash — and get your trip off to a flying start. By booking a package deal on Expedia, you can save up to 16%*. Choose from more than 400 partner airlines and 321,000 worldwide properties via our enormous database of flights and lodgings. Fly with who you want, stay wherever you want — now that's a dream holiday! Can't wait for your trip to Sydney? Want some recommendations about what to do when you arrive? That's where we can assist! Sydney Opera House and Bondi Beach are part of the thriving heart of this place. Much loved by both travellers and locals alike, these famous attractions ought to be non-negotiable fixtures of your itinerary. Whether they're built from metal, stone or concrete, bridges are among the world's most well-known architectural wonders. Admire the design of Sydney Harbour Bridge and learn some more about its rich and intriguing history. Travellers in this destination are spoilt for choice. Treat your inner child with a heart-stopping day out at Luna Park! Fun, food and rides aplenty — get ready for a good time! Still got some time to spare? Get yourself into the holiday frame of mind by knocking back your favourite beverage at The Intersection. Whether you're craving a glass of champagne or something a lot stiffer, it's the ideal place to get cosy for happy hour. In the mood to create some great memories? A holiday is the perfect time to try out some cool new experiences. Head to our Sydney things to do page for a complete list. 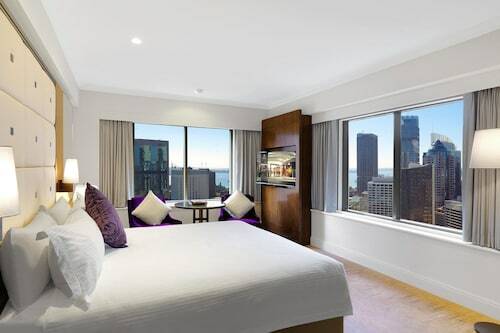 Sydney offers a large variety of accommodations for those seeking cheap holidays and luxury getaways. So why wait around? Book now on Expedia and get your adventure started. After an exhausting flight, there's nothing more pleasant than kicking back in a swanky room and indulging in some room service. See what delicious treats are waiting for you at the Park Hyatt Sydney (7 Hickson Road) or the Pullman Quay Grand Sydney Harbour (61 Macquarie Street). If you'd prefer to spend your hard-earned cash on things like hair-raising adventures and wild nightlife, why not check out a few of our low-price options? The Ultimate Apartments Bondi Beach (59 O'Brien St) and the Manly Beachside Apartments (29 Pittwater Road) come recommended. One of the must-sees of any visit to Sydney is Sydney Opera House. 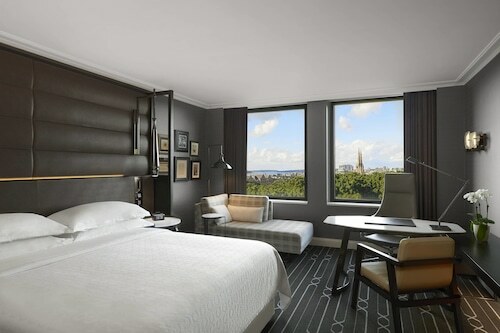 If you'd like to stay within close proximity of this unmissable attraction, the Quay West Suites Sydney and the Establishment Hotel are both recommended options. 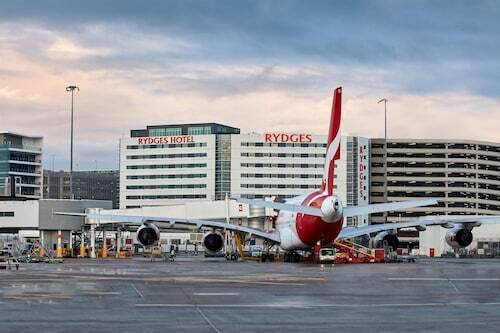 Nothing compares to finally coming in to land at Kingsford Smith International Airport (SYD) after a lengthy flight. After you've claimed your bags from the carousel and stretched your legs, you'll find yourself around 5 miles (8 km) from the bustling main streets of Sydney. 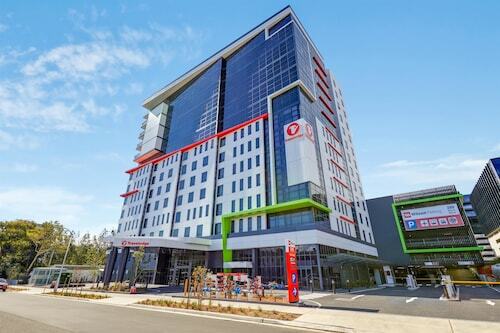 Situated near the airport, this luxury hotel is 2.8 mi (4.4 km) from Westfield Eastgardens, and within 6 mi (10 km) of Maroubra Beach and Moore Park Golf Course. Centennial Park and Sydney Cricket Ground are also within 9 mi (15 km). Mascot Station is 10 minutes by foot and Domestic Airport Station is 16 minutes. 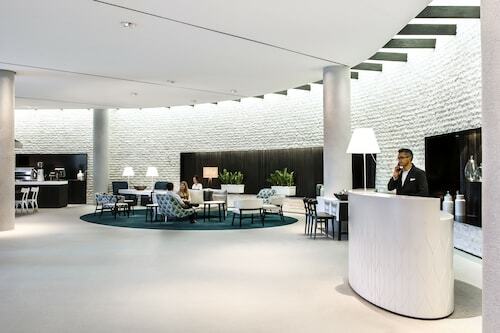 Located in Sydney Central Business District, this luxury hotel is within 1 mi (2 km) of Circular Quay, Sydney Opera House and Sydney Harbour Bridge. Hyde Park and Central Park are also within 2 mi (3 km). Wynyard Station is only a 3-minute walk and Sydney Circular Quay Station is 8 minutes.